Deadman’s Cove, NL is a tiny community nestled in the Straits region that presents some of the first views of Labrador. A number of people stop to take walks along the beach and venture onto the “head” (end of land) and watch the waves crash against the rocks. I’ve been often tempted to drive some eco-friendly golf balls from this point. 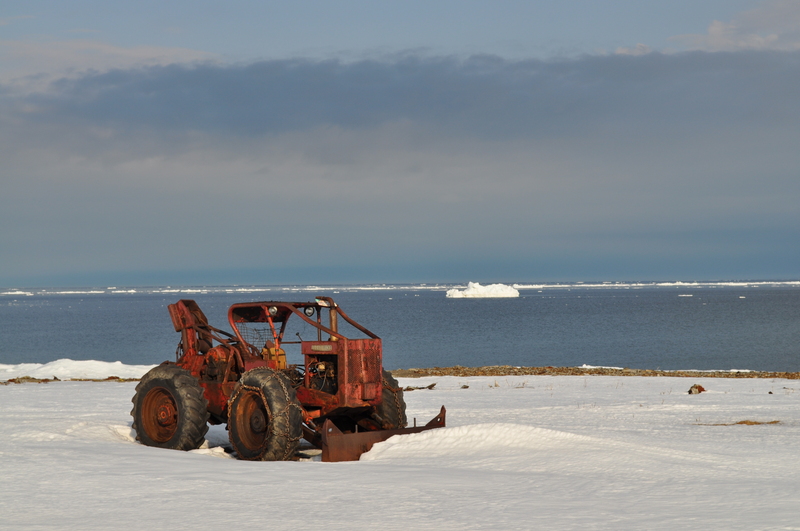 On Tuesday, I took this image of an old timberjack and the remains of pack ice that regularly fill the Strait of Belle Isle during winter. I hope this remaining piece is a good sign for icebergs this summer. Last year, we saw the massive icebergs from the Peterman ice island make their way to Goose Cove, St. Anthony, St. Carol’s, Conche, Main Brook, Englee, St. Lunaire-Griquet, L’Anse aux Meadows and surrounding areas. I encourage those to make plans earlier than normal, as there are several Come Home Year Celebrations in the District this summer and accommodations may book up earlier than usual. Anchor Point & Deadman’s Cove will jointly host a Celebration from August 12-18th, 2012. Be a part of the celebration of what it is to Live Rural NL! Posted on April 12, 2012, in Landscapes/Geography and tagged englee, Great Northern Peninsula, L'Anse aux Meadows, Labrador, Main Brook, Newfoundland & Labrador, St. Lunaire – Griquet, Strait of Belle Isle. Bookmark the permalink. 1 Comment. Yeah the GNP not to mention the NDP! I have many fond memories of the area, both before and after being the candidate in the May 1997 Federal Election. Met many wonderful people and have often been wowed by the scenery, as on one lovely summer lunch hour I munched away in the area of the skin boot church at Flowers Cove. It seemed to enjoy a specially warm microclimate with sun dancing on the blue sea and bringing out the zing in the coral red paint job.